A song from the ‘Sweethearts of Love’ will help entertain our listeners all over the world when we powerplay it in April. It’s a hit form the from the first act to be known as Peaches and Herb and takes us all the way back to 1968. 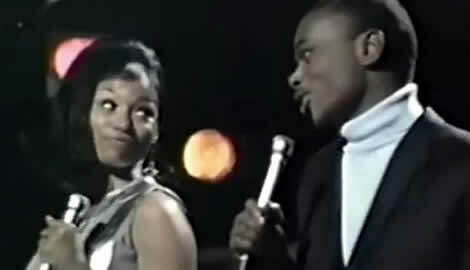 Peaches and Herb when they finally made it towards the end of the 1960s became known as the Sweethearts of Love. From 1968 there was one Peaches on stage and another on the records. Then Herb joined the police force. He reemerged in 1976 to once again to bring Peaches and Herb back to life. Legendary record producer Van Mc Coy who had started the act in the 1960s found him a new Peaches. Her name was Linda Greene and this lead to the smash 1980 No 1 hit by Peaches and Herb, Reunited. We are all familiar was Peaches and Herb and the soul sounds from the 70s. The 1970’s Peaches and Herb track Reunited is a Capitol.fm favorite. If you’re new to the World Station, check it out as you’re sure to hear it if you listen regularly. However, the 1970s Peaches and Herb was in fact the third incarnation of the cat known as Peaches and Herb. It was initially started in 1966 when a legendary record producer Van Mc Coy who met Herb Fame when he was working as boy in a record store. After signing Herb to the record label Date Records they found him a female partner at the record label. Her name was Francine ‘Peaches ‘ Baker. Their first single was ‘We’re in this together’ and although it was widely distributed to the America radio network, it just didn’t catch on. That’s before December 1966 when a St Louis disc jockey played the B side of the single. It was a cover of the famous 1934 tune called ‘Let’s fall in Love’. Hit. Over the next two years Peaches and Herb recorded a string of US Billboard 100 hits. They’re smooth sound earned them the sobriquet the ‘Sweethearts of Soul’. This week we’ve added the 1960s sound of Peaches and Herb to the Capitol.fm World Station playlist beginning with a lesser known hit from 1968. It’s Two little kids. The original Peaches departed the act in 1968 while on tour and was replaced by a lady called Marlene Mack. She became the new Peaches on stage and for tours while the original Peaches was still heard on the recorded tracks. Capitol.fm also plays the 3rd incarnation of Peaches and Herb. It occurred after Herb joined the police department and only emerged in 1976 to again have a go at the music business. Van Mc Coy was on hand to help again and teamed him up with Linda Greene. By March 1979 ‘Shake your Groove thing’ was Number 5 in the Billboard Top 100 but then came ‘Reunited’, the Grammy nominated single based on the 60s track called ‘United’ which catapulted the act to the Number one spot in the United States in 1980 and also to music and radio immortality.